We’re all busy people with limited amounts of free time, and many of us wish we made just a little bit more money. So, it’s pretty meaningful when we dedicate our limited time and treasure to help others in need. Volunteer opportunities are plentiful in our region, and so many organizations would benefit from our donations of money or needed supplies. The following list is by no means comprehensive, but it’s a starting guide to explore the various ways in which we can help our community. For some parents, throwing their child a lavish birthday party just isn’t an option. Enter Rosie’s Birthday Club, a nonprofit that seeks to recognize every child on his or her birthday. Birthday parties take place every week at various Boys and Girls Clubs in the Rockford area. You can volunteer to play games, make crafts and help celebrate the birthday kids, or give a monetary donation for birthday presents and party supplies. Sign up to volunteer at rosiesbirthdayclub.org. There are many ways to volunteer your time and talents to help the homeless, hungry and impoverished. Consider serving a meal or tutoring an underprepared job seeker. Or, donate items the Mission needs on a regular basis, such as canned goods, salad dressings, pens or calculators. (Find a full list of needed items at rockfordrescuemission.org). You can also help out by dining at Restoration Cafe, 625 W. State St., Rockford, or shopping at Remade, 611 W. State St., Rockford, both affiliated with the Mission. If you enjoy reading, educating, or simply helping others, consider channeling those passions into improving literacy rates in our community. The Literacy Council provides opportunities to help both adults and children. After receiving training and materials, you can help teach an adult learner how to read, write and speak English. Or, you can opt to mentor up to two students a week through the I READ program, which pairs volunteers with students in local school districts. I READ, a partnership between The Literacy Council and United Way of Rock River Valley, is all about helping early-grade students become proficient readers. Visit theliteracycouncil.org to become a tutor. Whether you give time, food or funds, there are many ways to help our hungry neighbors. 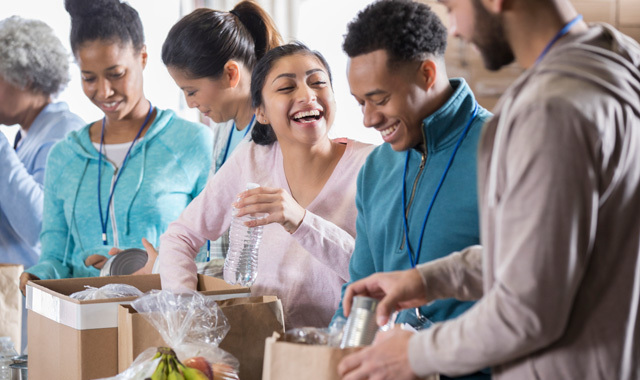 You can make an impact by inspecting, sorting and packaging food, serving food at pop-up pantries, or, if you want to go big, consider hosting a food drive or a fundraiser of your own. Monetary donations can also go a long way, since Northern Illinois Food Bank can provide about $8 in groceries for every dollar that’s donated. Figure out what volunteer method is best for you at solvehungertoday.org. 8801 N. Second St., Machesney Park, Ill. There are many ways to be involved at our local Down Syndrome Achievement Center, which strives to see the world accept and embrace individuals with Down syndrome. Help with administrative tasks, tutor a child to read, or volunteer at one of the many fundraising events throughout the year. Visit gigisplayhouse.org to get involved. If you make one big donation this year, consider giving to the Nikolas Ritschel Foundation, which brings joy to young adults fighting cancer. Similar to the Make-A-Wish Foundation, this organization grants wishes to cancer patients ages 18-24. Visit nikolasritschelfoundation.org to make a donation or find out how you can volunteer at future fundraising events. Many young girls in the Rockford region have experienced unthinkable trauma and neglect. KFACT seeks to empower these girls through continued services and mentorship. You can invest one-on-one in a KFACT mentee with a monetary donation, host a drive for dorm room essentials that go to KFACT’s college students, or simply help out with clerical tasks, social media posts and other assignments. Visit k-fact.org to get involved. Volunteers keep this historic mill operational. But a new generation of volunteers is needed to keep it alive. Those with a passion for preserving history can visit beckmanmill.org to inquire about current volunteer opportunities. This multi-service agency helps older adults and disabled adults in our community. Volunteer opportunities are available in a wide range of capacities, from clerical work to visiting with seniors. If you’d like to help seniors maintain their independence and quality of life, visit seniorresourcecenter.net to volunteer. Sat., May 11, at 4919 Blackhawk Road, Rockford. Run/walk in the half marathon, 5K or 3K to support The Gold Star Mission, a nonprofit that preserves the memory of those who lost their lives in service to our county. The nonprofit also raises funds to help the family members of fallen heroes achieve a higher education. Sat., July 22, at Martin Memorial Park, in Loves Park, Ill. Support the Pink Heals Winnebago County chapter, which raises awareness and funds for those battling cancer in our community. Artists’ Ensemble (Rockford); Beloit Janesville Symphony Orchestra; Byron Civic Theater; Freeport Art Museum; Main Street Players of Boone County (Belvidere); Mighty Richland Players Dessert Theater (Orangeville); Monroe Arts Center; Pec Playhouse Theatre (Pecatonica); Rockford Art Museum; Rockford Coronado Concert Association; Rockford Dance Company; Rockford Symphony Orchestra; The Next Picture Show (Dixon); Winneshiek Players (Freeport); Wright Museum of Art (Beloit). Still not sure how to get involved? LetsThrive360 can pair you with a volunteer opportunity in our region based on your interests and experiences. Visit LetsThrive360.com to find out more. Again, this list is by no means comprehensive. You might also consider volunteering with your local church, or with the Salvation Army. Maybe you volunteer on a school board, or any board of directors. Maybe you lead your child’s Girl Scout troop. There are hundreds of ways to positively impact our community. We challenge you to pick one way to volunteer your time, talents or treasure this year. This entry was posted on Tuesday, April 9th, 2019 at 12:00 pm	and is filed under Annual Guide, Mind & Spirit, Top Posts. You can follow any responses to this entry through the RSS 2.0 feed. Both comments and pings are currently closed.